Image: The main iconostasis in St Kazan Cathedral, St Petersburg, Russia. Much ritual; western ceremonial magick in particular; just looks daft when viewed from ‘the outside’. It’s a participatory practice and rarely works as a spectator sport. Ritual is experiential in nature and there are few forms that can be viewed and appreciated without most of the active ingredients being completely lost. It can look truly hokey. The trappings of ritual (again, especially western ceremonial) are so loaded with pre-existing cultural and pop-cultural meaning that use of them is very difficult unless it’s in a deliberately self-aware way, which lends itself more to the glib and ironic. Candles, incense, swords, robes? Pile all those together and you’ve got yourself a bad amateur horror movie. Blatantly utilising the ritual language of cultures that are not my own for the sake of my art smacks of appropriation and the arrogant surface skimming of something I can’t truly understand. In a personal ritual setting experimentation with new practice is enriching, but for something like my video art I think it is gauche. The best way for me to work with non-western ritual language would be to collaborate with a practitioner who understands the deeper context and for me to take more of an ‘outsider’ position. This is something to consider for future works. Ritual as a live performance piece is fraught with many of the same problems, especially the ‘cringe factor’ that comes with the cultural loading mentioned above. For both video and performance I’m inclined to remove most of the symbolic aspects that the audience is familiar with and, if I keep any (eg the kind of robed dress I’ve been using), angle it away from the ‘witchcraft and sorcery’ connotations. I’ve been leaning in the direction of historical art in gesture and form so that the work alludes to Renaissance or Baroque art which I hope lends it a different symbolic texture. Looking again at Mikala Dwyer’s treatment of esoteric themes in her work I’ve been influenced by the way she has subverted and also utilised the loading of the forms she has used. Her robes and costumes for example still retain the connections to magical dress but they use fabrics and forms that have different connotations and so take the symbolism to a new place. Likewise her performance piece Goldene Ben’der (2013) which sees hooded participants robed in golden lamé attempt to defecate publicly into clear perspex seats which are later displayed. While this work may seemed to have a humorous aspect, it also captures both the seriousness and visual ridiculousness of ceremonial magick in one go. Very clever I think! I spent some time pondering the kinds of rituals that are meant to be viewed as well as experienced and I came to the concept of the Mass. Aleister Crowley created a Gnostic Mass as a ceremonial ritual that I believe is the only example within his canon that is intended to be viewed by non-participants, although that’s an interesting point to play with as truly the congregation are also participants through the aspect of the Priest. Crowley was hugely influenced by a Russian Orthodox Mass he witnessed, so while in St Petersburg I attempted to attend one to get a feel for what impressed him. I wasn’t able to attend a Mass, as I was not there on a Sunday, but I did attend a Russian Orthodox liturgy at Kazan Cathedral. Obviously I took no photos at the time of the service. The cathedral has a central altar and 2 side altars, the Evening Liturgy was at one side and was cordoned off for worshippers. In order to be part of it I needed to wear a scarf over my head and I paid attention to everyone else to try and make sure I was doing the right thing. There is an awful lot of genuflecting, but apart from that it was actually quite relaxed with people coming and going. The altars are not visible to the congregation at all. There is a three part divider in front of each of the three altars called an iconostatis. Only the high clergy can go behind this to the altar and I believe it is only ever opened at Mass. There are three clergy involved and they move around a lot; in and out of the 2 side doors in the iconostasis (but not the central door, they adored this but did not open it). There is a small altar within the congregation in front of the altar steps. This gives the chapel a three-point area of movement for the clergy: 1 behind the iconostatis (at the high altar), 2 in front of the iconostatis on the dais and 3 in the congregation on a lower level. One of the clergy takes incense around the whole perimeter of the chapel area and everyone turns towards him as he walks. The congregation stand for the whole time. I had no idea how long the liturgies would go but I realised after an hour that they were actually looping round and it didn’t seem like they were going to stop any time soon. They genuflect a lot: head, base, right, left, touch the floor. The loveliest part is the continual chanting and singing. The clergy chants the liturgies and an invisible choir up behind us sang in a call and response with the clergy. It’s worth having a listen to a Russian Orthodox service if you are interested because it truly is spine-tingling. I find this whole quandary of portraying active ritual very interesting to think about. I find it very difficult but a great challenge. There are going to be some serious failures coming up, but a good ‘art fail’ is the best thing to point you in the right direction! I came across Saya Woolfalk last year when I was looking at an article on the Artsy site about shamanism and contemporary art. I’ve thought about her work quite a bit since then and how to express my reaction to it, because that reaction is also deeply connected to how I feel about my own work. As different to hers as it is visually, there is an underlying similarity in intent I think and also in medium and execution. I was initially drawn to a video loop on the header of the article showing a triple-blue-faced creature with multiple arms and white felt feathers floating through some kind of alien dreamscape. It brought up a lot of feelings and sensations for me – things I associate with the early 90s and attending the Goa-trance parties that were popular at the time. The quasi-shamanic costuming and facepaint, the ‘trippy’ computer graphic landscapes, the allusions to futuristic shamanic practices and the unabashed psychedelia. These dance parties were full of people painted with fluorescent paint, in wild costumes and immersive environments often created and elaborated on by the attendees themselves. Saya Woolfolk describes much of her work as being woman-centric – She has created a virtual world inhabited by the Empathics, a race of hybrid futuristic women who are able to fuse with their environment. This also reminds me of these dance parties where people tended to ‘get in touch with their higher selves’ and men were able to express a more feminine aspect. She works with many people to create collaborative pieces: dancers, videographers, animators, and it appears that she allows them the freedom to add their own expression to the work rather than it being solely directed by the artist. Much of her work is multimedia multidimensional in not just the sense that she is exploring other dimensions but also in the sense that she works within multiple dimensions in the ‘material world’ too, allowing viewers to experience a fully immersive environment. Saya Woolfalk, An Empathic Preparing to Paint Images from the Book Empathetic Plant Alchemy (Jillian), 2011. Copyright Saya Woolfalk, courtesy Leslie Tonkonow Artworks + Projects, New York. Installation view of Saya Woolfalk, ChimaTEK Life Products Virtual Chimeric Space (Detail View), 2015, in Seattle Art Museum: “Disguise: Masks and Global African Art.” Photo by Nathaniel Wilson. Copyright Saya Woolfalk, courtesy Leslie Tonkonow Artworks + Projects, New York. I wondered how Woolfalk examines cultural appropriation in her work in relation to the cultural shamanic cues she is using and their usage within the work of a Japanese-born New Yorker? She speaks of ‘cultural hybridity’ which I think is an interesting flip side to cultural appropriation; the coming together of cultures and creation of new culture rather than one taking from another. I know I personally get paralysed sometimes in my own work with worrying about the privilege of being a middle-class European in a developed country and whether I am appropriating culture that is not mine. Sometimes I stop making because I start to overthink the materials I’m using and the form it is taking. It’s probably more useful for me to just make the things THEN analyse how they fit within the cultural landscape rather than not making them at all! In relation to my own work I’m also fascinated with what Woolfalk can ‘get away with’ when it comes to the otherworldly – probably not the best phrasing, but this is in relation to me and my practice rather than a critique of her work, as I’m really impressed with the passion and the gusto with which she executes her practice. Another learning from Woolfalk’s practice for me; it’s much more constructive to unapologetically embrace the work you want to make and look for it’s place within the current contemporary art landscape than to quash is out of nervousness of negative critique. As ever when dealing with subject matter that is emotional, spiritual, non-ironic there is a line to be walked – fall too far in one direction and the work can become mawkish and kitsch. But if you don’t step over the line, then you don’t know where it is, so I think it’s perfectly ok to go there and then draw yourself back – as I have done on a number of occasions. There is a lot to learn from overstepping the mark and finding out where the boundaries are. This brings me back to those Goa trance parties I used to go to. I think at their best these parties were living works of art; beautiful, full of life and raw creativity. At their most banal, they were the desperate posturing of modern kids wanting to take drugs and have some sort of empty spiritual epiphany. Art is at risk of being like that too. From Cyrill Schlepper’s “UR Musig” documentary about Swiss Folk Music Traditions. “Wilde Chlausen” from Urnäsch in Appenzeller Land. Stay tuned for a lot more images of traditional ritual costume that I have been researching over the last few weeks! On the secondary Justine and I caught the train out to Newtown for breakfast and wandered back into the city stopping at Biennale venues along the way. The Carriageworks hosts the Embassy of Disappearance. Rosenthal, S. (2016) The Guide. Sydney, Australia: 20th Biennale of Sydney. The Afronaut works but Gerald Machona were both amusing and poignant. We see the outfits the Afronauts wear displayed as sculptural relics, as well as their journey in the form of a video piece. The costumes made of decommissioned currency parallel the state of the disenfranchised legal alien adrift in their own land. The Afronaut characters reference ‘Nyau’, a form of ritual dance incorporating masks that originates in Malawi. Thai artist Apichatpong Weerasethakul creates film and experimental video works that address memory and representations of reality. He describes the work ‘Home Movie’ as being a ritual space in a cave-like environment where spectators gather to observe the light of the fire. I found this work mesmerising probably due to it’s elemental and ritual nature which are themes that appeal to me personally. I also spent a great deal of time watching the work and thinking about the way it was made; a ring of fire surrounded by fans that blow the fire in gusts and eventually become consumed themselves imitating a dying planet. Jus and I discussed how dangerous this would have been to make what with the electrical-powered fans slowly being consumed by flame. I was thinking about the kind of studio set-up you would require, what sort of fire regulations would need to be in place etc. It was much to our amusement that we discovered the piece is called ‘Home Movie”! The Embassy of Disappearance is a huge gallery space and I’ve only choose 2 works to show here, but we spent several hours there looking at all the pieces. I got really tangled up with whether certain pieces functioned effectively or not and Jus had to bring me back to the present so we could make it on to the next stage because we were both dying of thirst. After stopping for a drink and a sit-down we continued on to the Embassy of Transition which is housed in the beautiful Victorian Mortuary Station. Charwei Tsai’s coils of incense have scripts written on them in different languages that contemplate the Bardo (the state between death and rebirth). During the course of the Biennale the coils will burn away and will not be replaced. Looking at photos of her incense coils installed in different environments I felt that the Mortuary Station was very ‘busy’ in its setting, it’s ornamentation and style so that the quiet contemplation of the installation was lost. The meaning was still there, but the feeling of that state of transition between worlds was nullified by the visual clutter of new-victorian architecture and the busy tiled floor. I spent some time talking to the woman who had been employed to look after the works in this Embassy (mainly as a zoologist to care for the birds in Marco Chiandetti’s works). Apparently the install had its own set of challenges that I was grateful to hear about; its easy to forget that well established artists deal with the same sorts of unanticipated questions and challenges that we do. Tsai had decided to install the objects lower than she at first envisioned because they would be lost in the rafters and it was definitely more engaging for us viewers to walk amongst them. There was also the challenge of the wind speeding up the burning process – will they last for the entire Biennale? The ash was being blown around the area rather than making circles on the floor, so the attendant was sweeping it up periodically rather than leaving it as it would be in an interior install. Marco Chiandetti’s ‘The boundaries which divide Life from Death are at best shadowy and vague. Who shall say where one ends and the other begins?’ was installed but not yet active. The large aviaries and birdseed objects were in place but the myna birds intended to inhabit the installation were not yet present due to a hold-up with animal welfare permits. I would very much like to see this work progress over the course of the next couple of months. We continued on the the Gallery of New South Wales to visit the Embassy of Spirits. Along with the Museum of Contemporary Art, this was the most traditional gallery space. Dogwalk by Dutch artist Mella Jaarsma is a set of performative outfits and a video showing performers wearing the costumes within the bounds of a ‘dog walk’. Initially I found the outfits and the video deeply disturbing; I think this could be because I don’t eat meat and am very concerned about animal rights? The costumes with the calf skin trailing it’s legs along the ground (above centre) upset me the most because it seemed like a small animal being dragged to death. For me the ‘Dogwalk’ spoke of the different relationships humans have with animals that are considered companions and those that are considered food. Reading about the artist’s intent it is a similar idea from a different viewpoint; the animal skins are those that have been slaughtered in Islamic ritual, but are being compared to dogs that are considered unclean. There is also the juxtaposition between cultural relationships to animals; in the west we consider dogs companions, in Islamic countries they are haram. She also delves into the idea of the trickster in folklore, the shaman wearing the skins of animals, human-animal hybrids etc. It’s interesting because I’m not repulsed by shamanic characters in animal skins, maybe because there is a reverence at play? I saw no reverence in this use of skins which is perhaps what gave me such a negative reaction? The soundtrack music was jarring yet hypnotic and I felt it was very effective… I’m still not sure how to feel about this work, I think it was the one that affected me the most in terms of repulsion, but at the same time drew me in because I was fascinated by my own reaction. Walking through the door from ‘Dogwalk’ you encounter Nyapanyapa Yunupingu’s My Sister’s Ceremony which I found to be a soothing reprieve from the animal carcasses. A cool, dimly lit room is dappled with light and filled with a dream forest of marked and engraved wooden poles. She uses a meditative mark-making practice as a kind of ritual and an expression of the action of her hands. I enjoy experiential environments and I feel they are a successful way to convey the subtleties of ritual otherworldly experience. ‘My Sisters Ceremony’ did this with darkness and quiet, a womb-like ambience. Taro Shinoda’s Abstraction of Confusion use’s space and bright light together with the cool scent of drying clay to create an environment that conjures the tranquility of zen contemplation. This is a place of stillness, abstraction and thought. The coolness and smell of the space are soothing and work to quiet the mind and promote introspection. Finally, the ‘Liquidation Maps’ of Yin-Ju Chen. When Justine and I saw these we joked that they could be the unholy offspring of both of our art practices! 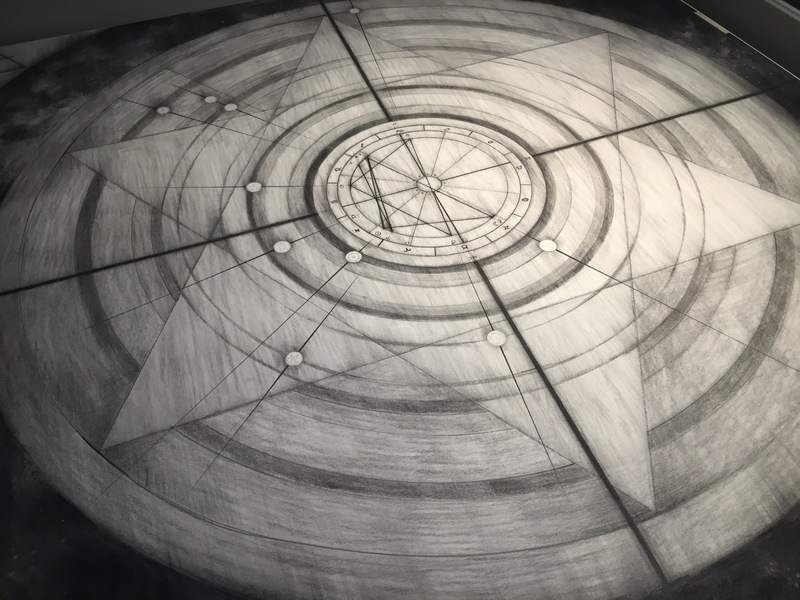 We imagined my work and her work combining and giving birth to this show; detailed drawing, artefacts, alchemy, astronomy, macrocosm and microcosm, diagram-making and historical referencing all in one! 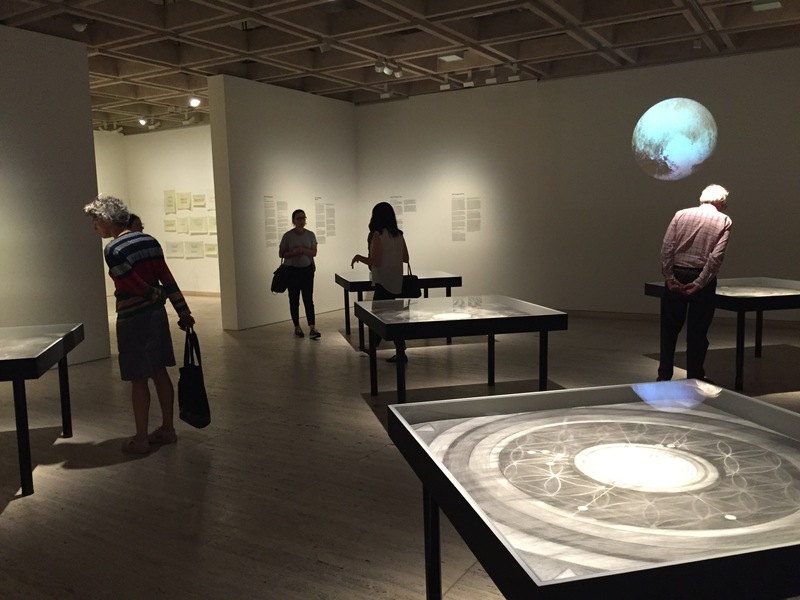 In this installation Chen references important events in Chinese history then maps them as cosmic cartographies showing the position of the planets and the stars when the event unfolded. She references the interrelationships between cosmic events and human behaviour, the macrocosm and the microcosm. I appreciated how the works were displayed. Placing them in tables increased the cartographic and scientific presence, if they had been hung on the wall I feel they would have become more decorative and have held less weight. There is a new exhibition on currently at the Tate Modern called “Performing for the Camera”. I had a look through the works on display and it got me thinking again about some of the ideas I’d grappled with last year when making my first performative videos, as well as my dabble in live performance. In my mind, the statements ‘performing to camera’ and ‘performing for camera’ are two very different propositions. The first denotes a connection with the camera (and therefore the audience behind the camera) that is likely to be realised through direct dialogue in some form; not necessarily speech or eye contact, but an obvious angling of the performance to the viewer. All actions are performed ‘to’ the camera – the audience is the camera. The second suggests the performer has an awareness of the presence of the camera and, therefore, of a potential audience. But the performance might not include any direct dialogue with the camera in the form of gaze, gesture or speech. A performer could quite well perform in the distance with their back to the camera and still be performing ‘for’ the camera. When creating my pieces last year I made the decision that the performances would be ‘to’ the camera. 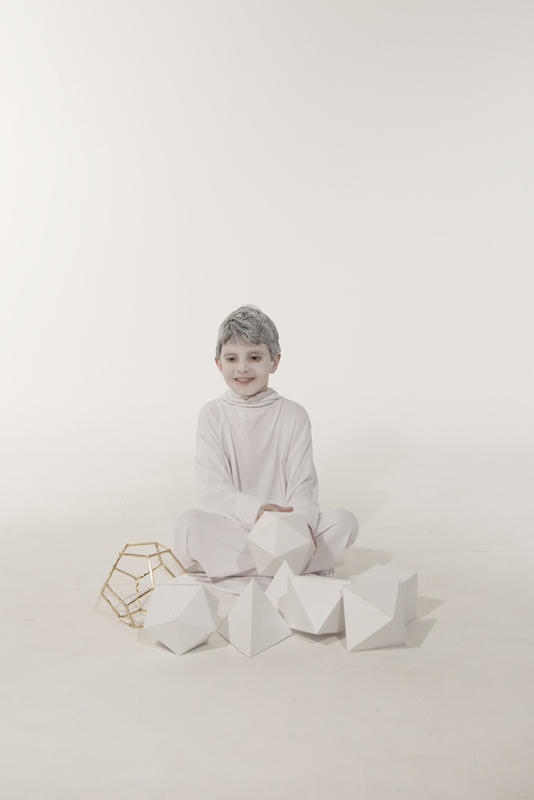 In Hive Oracle (2015), Sublimation (2015) and Albedo (2016) there is direct eye contact from most of the performers. Some performers in Albedo do not make eye contact with, or address the camera, but their pose and gesture is angled to the camera’s presence. Working with performers I found many differences in the way still photography and moving image recognises tone and gesture. An expression that might be captivating in a still image becomes overwrought and overacted as soon as the image is moving. This is equally noticeable in my barely-moving tableaus which straddle the line between image and moving image. It was imperative for the work that I did not end up with performers who looked like they were Performing (capital P). I’ve seen this happen before with performers who, no matter what role they are taking on, are always, intrinsically themselves. In certain circumstances this is a strength, but it’s not what I needed for this work. Then the other side of the coin is hoping to work with inexperienced performers to find a naturalness in the work, but they can be too anxious to relax. Luckily I was able to work with some great performers who were able to relax into the roles and give an understated, natural performance. There is a set of new work by artist Amalia Ulman showing in this exhibition that interests me particularly. Her Excellences & Perfections series appeared on instagram as what at first glance seemed to be the heavily curated selfies of a preening millennial. It was infact a scripted and well-planned performance of three consecutive tropes of young female internet celebrity existence. There are layers of performance going on within this work: the performance of Ulman as the women in the work, the performance of Ulman as a woman in everyday life, the performance of Ulman in the art world as a young artist, the performance of Ulman as the artist performing the art; it just goes on and on, bending back upon itself. Very interesting. I was wondering how much of Ulman herself exists as parts of the tropes she was performing? How often is she knowingly or unknowingly drawn into playing those roles? With my next filing session I have some ideas around testing the performance of the actors to camera and around how much of themselves becomes present/not present. Hopefully there will be some curious outcomes. In 1966 The British Museum acquired an object of strange and convoluted provenance. It was a shiny black obsidian disc with a small looped handle that enabled it to be held. The object was said to be a scrying stone used by Elizabethan magician, and advisor to the Queen, John Dee. The black mirror was Aztec in origin and was said to allow Dee to view the spaces outside the material world. As a scholar and a scientist, the performance of ritual experiments was considered a part of his job description. Because experience of the otherworldly encompassed both scientific and spiritual research, scientists of the time had a great deal of interest in the secrets of occult ritual: of alchemy, astronomy, sacred geometry and the hermetic arts of the ancient classical world. Over time, especially in the West, this sort of experimentation has mostly been relegated to the realm of quackery. This doesn’t mean that our experience of these liminal spaces has disappeared – they still have the power to elicit both wonder and discomfort in even the most pragmatic observer. I would say being an artist or a performer or a director is also being a magician, and very often you need to use every trick you have in your pocket to make the show stronger. Within my own practice I have been exploring otherworldly spaces in the context of performance and the performative. I have experienced the role of the artist as both creator, director and performer – building a cosmology through the linking of objects and ideas, a cultivated web of interrelationships. My method of working has been flexible; spanning object, live performance and video, but always with a focus on the performative. Ritual as performance seemed an appropriate space to interact with the otherworldy, while also allowing the work to quite naturally manifest across a range of media. This approach to creating work can be seen in artists like Matthew Barney, who creates complex cosmologies through linking, relating and reimagining concepts and mythologies. Barney’s work interacts with the otherworldly and the mythological through seemingly absurd ideas and flimsy connections, which link together to create new constellations of meaning. With each project Barney exhibits an array of works and accompanying pieces – film, live performance, objects, drawings, writing, photographs. 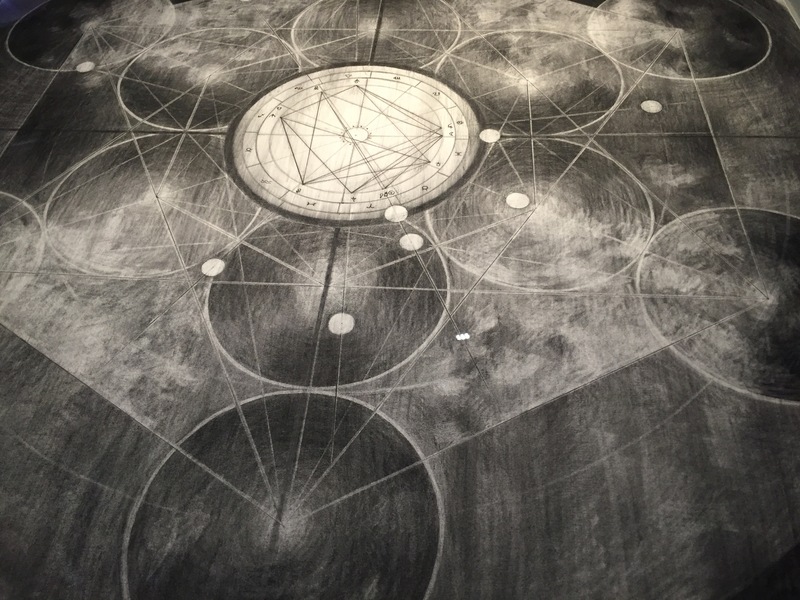 Often the works themselves are huge installations, like his Cremaster 3: The Order (2002) work at the Guggenheim, where the whole spiral gallery became a stage for the ascension of the initiate. In this section of Cremaster 3 we see his role as the Entered Apprentice interacting with tools, regalia and other performers. These objects are presented to the viewer not just as props within the live and recorded performance, but also as sculptural pieces in their own right. Barney utilises and sometimes even creates the objects within the performance. They then become available for the viewer to experience as sculptural performative objects, with the provenance of having been performed and the potential to be performed again, thus giving them an ongoing performative life. The language between objects, action and idea builds upon itself and becomes more than the sum of it’s parts. The richness and complexity of Barney’s cosmologies allows them to take on a mythological position that lives and grows outside of their creator. Because of his grandiose, esoteric and often confusing methods Barney attracts controversy and sometimes hostility from both critics and the viewing public. While on the one hand works that are too didactic can lack depth and interest, on the other, works that are too inscrutable can be equally frustrating. Taking and reorganizing historical and cultural symbols of importance calls into question his right to do so. Is he genuine or just being sarcastic? (Surga, 2015). The creation of a cosmology as an expressive framework can be as confusing for the creator as it is for the audience, particularly when built from heterogeneous parts that clash, confuse and challenge. Does each symbolic item work within the framework? As I have been working with both object and performance I have often had to ask myself questions when adding to my cosmology; should I be second guessing myself when something seems to fit? How do I avoid being didactic? How can I include some recognisable symbolic markers that allow access to the work without being overly trite? But when both the artist and the viewer are open to the experience there is a richness that surprises, as it unfolds into a more cohesive map. These are constellations that can be built, dismantled, added to and rearranged within a mythological cosmology. I see an interrelationship between the objects used in Barney’s performance and with the ceremonial ritual tools used in occult or shamanic practice. Ritual often utilises magical objects and theatrical performance as a way to access and experience otherworldy spaces. A gathering of specifically chosen tools or objects, a specially chosen environment, along with costume and adornment create an energy that enables the removal of the conscious, analytical mind from the ceremony. Anthropologist Michael Taussig made a connection between magical objects and the human relationship to the otherworldly, postulating that objects created a necessary conduit between humanity and the non-human world. When objects are performed by the practitioner (or artist) they can influence the method of performance. Performative objects speak their own language and require the performer to pay heed to their requirements. Sometimes they might require a subtle movement, sometimes a grand gesture. The performer becomes apart of the object’s conversation with it’s environment and the viewer is drawn into the experience. Australian artist Mikala Dwyer works across a wide range of media – utilising object, installation and performance to give life to her work. She creates her personal cosmologies within her collections of objects, costumes and performers. Dwyer’s Additions and Subtractions works are powerful examples of the magical potentiality created by collections of objects and their environment. The circles created in the works imbue an otherworldly space within their circumference – the objects are the performers and perform themselves without the need for human interaction. Adding or subtracting from the collection can change it’s very nature and the conversations between the objects create a constellation of linked meanings that form their own symbolic language. For me, working has been an evolutionary process, with branches on my ‘cosmology tree’ growing and joining to create a scaffold of ideas and symbols. This has been a process of uncovering, or discovering, these interrelationships as much as it is of creating. Much like Barney and Dwyer with their constellations of ideas and objects, the objects and materials being performed in the videos I have made in 2015 were recurrent from previous sculptural object-based works. The meaning and materials of my objects have followed me into the more performance-based work and have started to create an extended constellation of ideas that is building upon itself as a cosmology. It was not always clear to me at the beginning of the process that I was referencing tropes of Western art history – it’s mythology and archetypical characters. However, as I expanded the work I could see patterns emerging and giving strength to the work. Through consciously developing the references to this familiar imagery I am creating anchors for the viewer to gain clues and waypoints within the work’s cosmology. By using gesture and stylistic conceits from western art history I create a pathway into the otherworldy space. Using a certain amount of posed and unusual gesture in my work I reflect the gestural tone of classical painting and sculpture. Often the gesture and pose in these works is expressive rather than natural, they are poses you could make but probably wouldn’t. The gestures create a theatricality within the work – an elegant exaggeration of reality which pushes it further into the otherworldly space. The use of art historical anchoring is also apparent in work by video artist Bill Viola. In almost direct contrast to Matthew Barney, he has stated that he’s not interested in conveying narrative in his work. (Wroe, 2014) This has much in common with my own current practice. I’ve thought of the performative video work I have been creating as ‘the infinite moment’ – the endless experience of a time outside our own. Viola draws on the collective experience by using recognizable art historical and religious tropes. He draws on symbols and experiences familiar to us as human beings to devise a visual language that can be recognized by us all. I also appreciate his flagrant embrace of filmic techniques and technological methods, such as speed and duration, high definition filming, and engineering of special effects, to benefit his work. Through exploration I have discovered that a recorded performance allows for a higher level of control than live performance. I have been able to more accurately set the tone of my current work through using video format. An otherworldy space is by it’s very nature ‘not of this world’ and therefore hard to convey in a live, real world setting. When experimenting with live, participatory work I discovered that the amount of the experience outside of my control made the successful engagement of an otherwordly space difficult and unconvincing. For my current practice recording performance and then working with the moving image is a better way to maintain control over the tone of the work and for me, as the artist, to mediate the relationship between artwork and viewer. Women II (2014) he films within theatrical, constructed environments designed to mimic the exterior world but with no attempt to disguise their artifice; artificial light, artificial sound, artificial worlds that mimic our own. Costumes and characters that are unashamedly being ‘played’ and filmic techniques manipulating duration and speed, all work together to call into question notions of authenticity. The world he has created is a slightly warped mirror held up to our own. Working with the performative – particularly recorded performance – I have discovered a method that allows for the sublime, the unnerving and the amusing to exist side by side in a contemporary art context. It’s a bit of a fine knife edge to walk because it’s very easy to go too far, be too earnest, and for things to get a bit silly. But isn’t that always the way with ritual and magic? As I have worked through my practice over the last two years I have seen it growing and the same symbolic language ebbing and flowing throughout the works. Sometimes it is a complete surprise when and element or an idea pops up again or I find a new symbol that unexpectedly relates to something I was investigating previously. When dealing with realms of the otherwordly, sometimes, it is necessary to suspend doubt, even if not to admit belief, so that you can fully engage with the experience. Maybe sometimes art can be used like Dee’s black mirror, to reflect ourselves and our world, let us look through into the unknown and see what we might bring back. Taussig, M. (2014). Art and Magic and Real Magic. In E. Franzidis, (Ed). 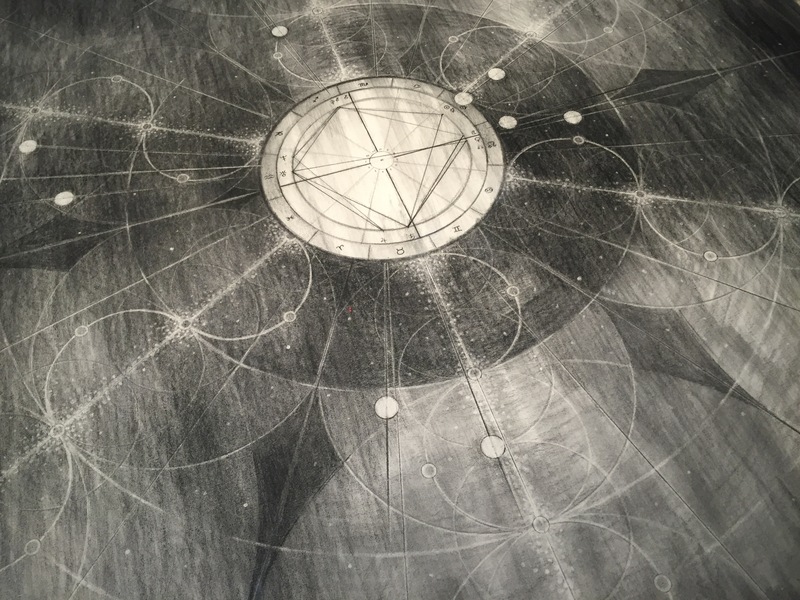 Mikala Dwyer: Drawing Down The Moon. Brisbane, QLD, Australia: Institute of Modern Art. Crowley, A. (1917). Moonchild. (1991 Reprint) York Beach, ME: Samuel Weiser. Enwezor, O. (2014). in Matthew Barney: River of Fundament. Neri, L. (Ed.) New York, NY: Kira Rizzoli. Wroe, N. (2014) Bill Viola: People thought I was an idiot and that video would never last. I’m very fortunate to have the kind of friends who let me dress them up and make them do weird stuff for the sake of my art practice. Earlier this year I created a diagram to examine the performative from the point of view of the artist. 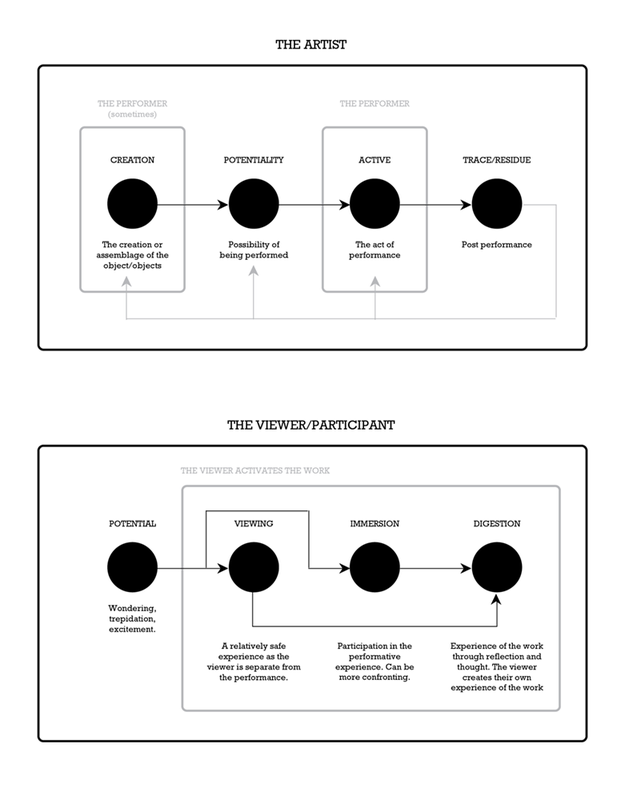 I had the challenge of creating a second diagram from the perspective of the viewer/participant. I might need to do a bit more work on this so any feedback is welcome! Here is where I have got to so far; the top diagram is my original, the bottom diagram is my new viewer’s perspective.